Cats just love moving water because of their natural curiosity about nature around them. Water coming from faucets and fountains movement constantly breaks the surface tension of the water and draws oxygen from the air into the water. This process is called aeration and it makes water more appealing to drink. 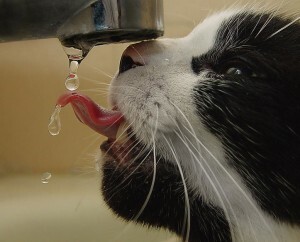 Cats may be drawn by instinct to moving water for this reason. You can either let your cats drink be leaving the faucets on in the sink or bathtub, or a more practical approach by having their own personalized cat drinking fountain.